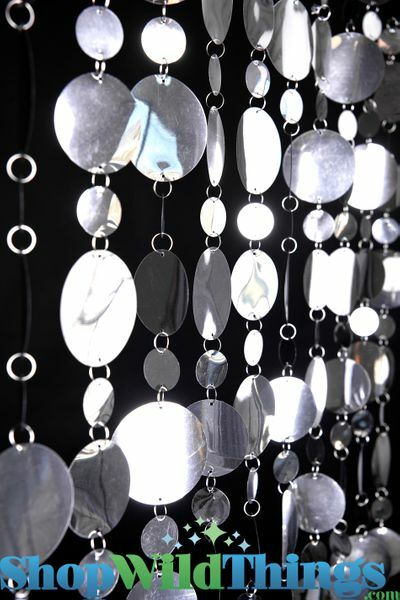 This fantastic Silver PVC beaded curtain features flexible discs attached to one another with jump rings. This curtain is an extra-long 8'! There are 10 strands all hanging from one 35" wide white header rod. Simply take the curtain out of the box and hang it right up! This is a bright metallic silver....very shiny! Below, our PVC curtains were used for the backdrop on this stage. The client used extra curtains to add length to the originals! Each of these beads are attached to the next with jump rings. So it only takes a few seconds to add strands to make extra long curtains. 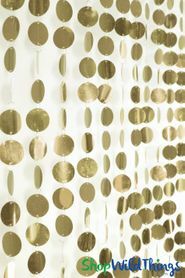 You can do this with any of our PVC curtains! You will just need to figure out the height of the ceiling. If you want your curtain to go to the floor, just buy extra curtains and use the strands to add the length. We promise it's very easy to do! 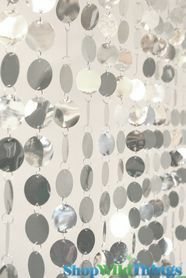 I could not have imagined more beautiful bead curtains! The colour is gorgeous & they shine & reflect the light perfectly! I had them up within minutes. I would highly recommend these to anyone!